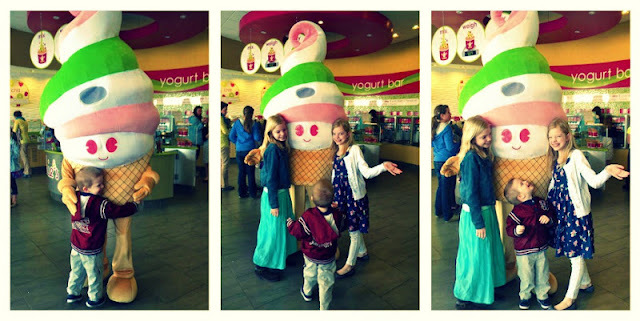 Following the art exhibit, Molly and I took the kids to Menchie's for a frozen yogurt treat. They love it there. He couldn't stop grinning. And laughing. And yelling at Menchie, "I love you! I love you!" At one point he said, "I could eat you!" and that was kind of creepy...but other than that...he really couldn't take his eyes off him. And he kept going back for hug after hug after hug...I thought he was going to knock Menchie over. Yes, it was as if Elvis had entered the building. He was so in love with Menchie. I don't think you will have to twist Q's arm to go back there again.